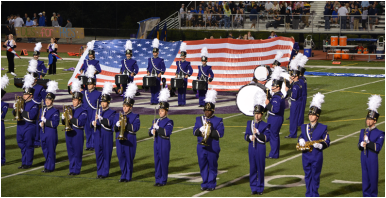 Welcome to the online home of the Baldwin High School Band, Orchestra and Guitar Programs﻿﻿! The primary goal of the Instrumental Music Program of Baldwin High School is to create life-long learners and lovers of music. To equip students with musical tools and knowledge that will allow them to perform with excellence during their time at BHS and throughout their lives. But the BHS Instrumental Music Program is about much more than just music. We endeavor to use music as a vehicle to give our students rich, transformative life experiences. To build a level of pride, discipline, respect and commitment that will set them apart as they embark on their futures. To serve our school and community while creating powerful works of art. To build friendships and relational skills that will last for a lifetime. The Baldwin High School Instrumental Music Program has been changing people's lives for over 75 years...come join us as we use music to change the lives of a whole new generation of Highlanders.